However, does the efficient extraction of economic value from material inputs also entail the protection of the environment providing those resources, most importantly by limiting global warming? The graph below partly answers this question by comparing indicators for productivity and pollution. The horizontal axis displays resource productivity: the economic value (Gross Domestic Product, GDP) created per kilogram domestic material consumption (DMC). The vertical axis represents pollution intensity, calculated as the amount of greenhouse gases (GHG) emitted per unit of DMC. The coloured trend lines are for the member states of the European Union, calculated over the period 2000-2011. The black dotted line is the overall trend. Malta is excluded since it has much higher values for both variables, although it confirms the trend. 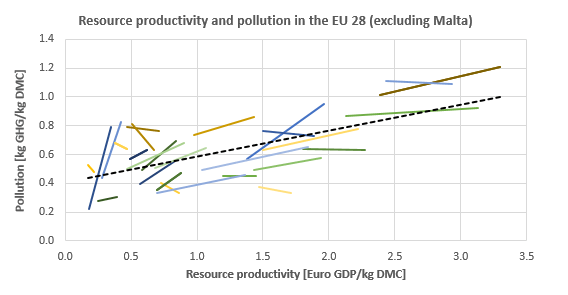 The figure shows that higher resource productivity correlates with higher GHG emissions per unit of material, implying a rise of total emissions per country under constant resource use. This relationship holds both for 60 per cent of countries across time, and for every year across countries. Also, the countries with upward trend lines show stronger correlations than the ones with downward trend lines. Most likely, countries experience similar development patterns and generally increase pollution with resource productivity. 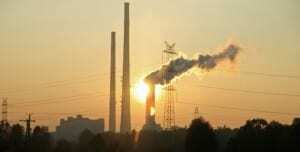 As a result, increased resource productivity is no guarantee for curbing climate change. Instead, striving for higher productivity under constant material consumption is likely to worsen global warming through increased total GHG emissions. This is not to say that resource productivity directly causes global warming; it merely shows that, all else being equal, higher resource productivity is not a good proxy for sound environmental stewardship. Also, it must be noted that pollution per unit of economic output actually goes down under higher resource productivity, which is good, but not enough to decrease total emissions. To make sure higher resource productivity does not come at an environmental cost, countries will have to alter the way in which they develop. Not surprisingly, other data reveals that countries with high resource productivity also use more energy per kilogram of material consumed. To curb climate change, resource productivity must thus be achieved either while using less energy-intensive materials, cleaner energy, or both. Alternatively, countries may move up along the trend line but still reduce total GHG emissions by reducing their domestic material consumption. This requires no change in the energy supply industry but demands radical changes in extraction, manufacturing, and consumption. This approach, known as dematerialization, requires absolute decoupling of the creation of wealth from the consumption of resources. So far, countries have achieved little in this regard. Unless we opt for a different model of economic development, resource productivity alone is unlikely to coincide with absolute limits to global warming. 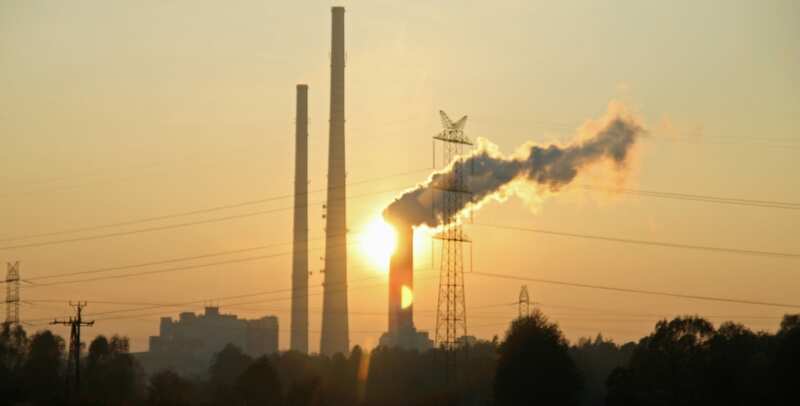 Fortunately, the European Union aims to adopt many secondary indicators focusing on (among others) air emissions, material consumption, and economic transformation. Some of these secondary indicators may approximate environmental progress better than resource productivity does, and we may have to watch them closely to secure a carbon free path to the future. The opinions expressed in this post are those of the individual author and not UCL ISR.